In a region often fraught with tensions over territory and shifting power, the sight of 13 countries co-operating for a common goal is rare and welcome. Yet questions over the use and sharing of information during the hunt for MH370 have revealed the continuing suspicions between them. The extraordinary revelation that US investigators believe the plane could have flown for up to five hours emerged only via a Wall Street Journal article based on unnamed sources. In public, officials are saying little. How much they are disclosing to Malaysia – and to China, which had more than 150 passengers aboard the flight – is unclear. China is deeply suspicious of the US role in the region. Some wondered if the reports on the US findings, with their unnamed sources, were designed to allow the US to avoid explaining too much about its technical knowhow. Elsewhere, patience appears to be fraying as the days go by. China, under pressure to show it can protect its citizens overseas, has repeatedly urged Malaysia “to report what they have … in an accurate and timely fashion”. Malaysia has criticised China for releasing satellite images which it had not passed to Kuala Lumpur. Vietnam at one stage scaled back its search, complaining of insufficient information. Malaysia reportedly chided Vietnam for announcing possible discoveries of debris prematurely. “We should be cheered by the intentions they have of working together [but] their ability to work together has been proved to be wanting,” said Taylor Fravel of the security studies programme at the Massachusetts Institute of Technology – though a large part of the problem, he noted, “is that it seems the Malaysians internally are not talking very well to each other”. As Malaysia sought to confirm whether radar sightings were, as it thought, of MH370, one obvious question was whether neighbouring countries could help. But asked whether the plane had suddenly disappeared off the radar screen, or flown out of Malaysian radar range, the transport minister said the information was “too sensitive”. It was not until Friday that he said Malaysia would share raw radar data with US investigators. 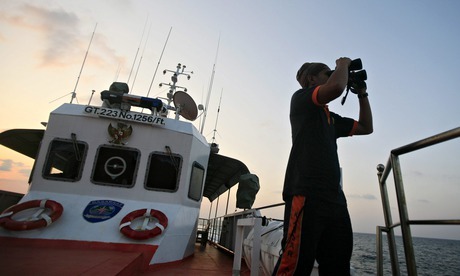 “Given existing tensions in the Asia-Pacific region and strained communications between several key regional countries, it is hard to imagine meaningful co-operation or military transparency between them on information such as radar readings in the effort to locate the Malaysian Airlines flight,” said Stephanie Kleine-Ahlbrandt, director of the Asia-Pacific programme at the Institute of Peace. Christopher Hughes, an expert on relations in the region at the London School of Economics, added: “This has been the problem since the end of the Cold War and really since the end of world war two … They have entrenched rivalries over so many issues – territorial, historical and so on – that it is almost impossible to get them to move toward any meaningful multilateral system. The South China Sea – one of the main areas of the search – is at the heart of a complex six-party territorial row; “Malaysia was supposed to be the country getting along with China among the claimants in the South China Sea, but even that relationship has deteriorated [recently],” noted Manicom. Despite the frictions, analysts see positive signs: “What’s remarkable is that Vietnam has allowed two Chinese electronic surveillance planes to fly through its airspace,” said Fravel. “Actually, this is not a multinational search; each country has searched by themselves,” added Hong Nong, a professor at China’s National Institute for South China Sea Studies.